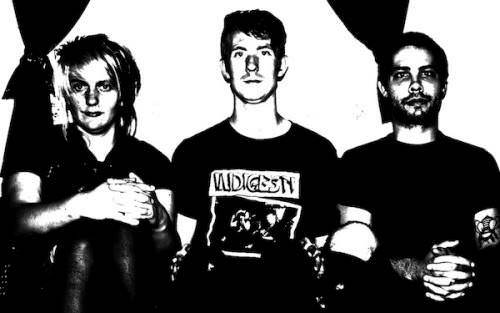 The first word any writer reaches for when talking about Philly punk trio Dark Thoughts is “Ramones.” From the moment singer-guitarist Jim Shomo shouts “Gimmie soda! Gimmie soda! Gimmie something I can drink!” on the opening track, it’s clear that in their delivery, musicianship, and aesthetics, Dark Thoughts are deeply indebted to punk’s royal family. But their blistering new LP At Work is no mere retread. Like their forefathers, Dark Thoughts know how to walk the line between economy and monotony—delivering a unified and repetitive musical assault with just the right amount of variation in tempo, dynamics, and chord changes to keep the energy at soaring levels. The band can thrash at the speed of Germs on tacks like “Hate This Song” and then slow things down to deliver a song like “With You” that recalls the Ramones’ oft-ignored talent for balladry. One walks away from At Work with the impression that Dark Thoughts understand their musical heritage on a deep level. They’re able to recreate the big-bang moment of punk’s inception with masterful nuance while sacrificing nothing in raw power. Let the slam dancing ensue. Stream At Work below. Dark Thoughts will be opening for Iron Chic at Boot and Saddle on 7/29; tickets and more information can be found at the XPN Concert Calendar.